If you have kids, you know how wild their imaginations are. Try and picture what their ultimate bedroom would look like? 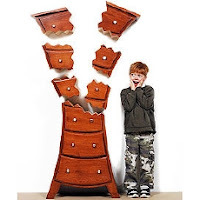 I bet the Boom Cabinet, with its exploded-then-frozen-in-mid-air vibe, would fit into a few of the little ones' bedrooms.